This sweet batch of moist and tender cake pops are every bit as delightful on the eyes as they are on the palate. 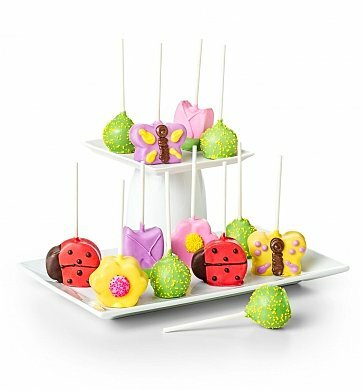 Twelve luscious pops are hand-dipped by our artisans in white, milk and dark Belgian chocolate, decorated with spring garden embellishments, drizzled with chocolate ribbons or coated in colorful spring decorations like ladybugs, flowers and butterflies. Twelve Mother's Day Cake Pops in Chocolate, Vanilla and Red Velvet Cake. Mother's Day Spring Garden Cake Pops is a hand delivered gift. These gifts are delivered by one of our local design centers located throughout the United States and Canada. Same day delivery is available for most gifts when ordered before the cutoff time. The cutoff time for Mother's Day Spring Garden Cake Pops is in the recipient's time zone. Perfect to send a little love and Happy Mother's Day wishes! Twelve fresh-baked decorated Spring Garden cake pops. Three different cake flavors: red velvet, chocolate and vanilla.